International trade, financing and investments, and the related cash and credit transactions, have grown at an extremely rapid pace in recent years. The international monetary system has continued to evolve to accommodate the need for foreign-currency denominated transactions and in the process has provided opportunities for its ongoing observation and study. 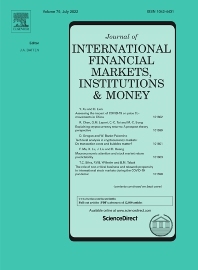 The purpose of the Journal of International Financial Markets, Institutions & Money is to publish rigorous, original articles dealing with the international aspects of financial markets, institutions and money. Theoretical/conceptual and empirical papers providing meaningful insights into the subject areas will be considered. The following topic areas, although not exhaustive, are representative of the coverage in this Journal.